Last week I had the extremely fun opportunity to tap into my more youthful side, and help a friend move her daughter to college. After I graduated high school, I went straight from living at home to living with five other kids in a house on campus. So although I didn't personally experience dorm life first hand, I couldn't wait to help organize a Genie sized living space (itty bitty) with phenomenal cosmic powers (we hope). First of all, no two dorm rooms are created equal. Even on this specific campus there were a variety of rooms in different shapes and sizes. My friend's daughter was moving into a double occupancy room, which offered her a twin size bed, desk, mini fridge, armoire and set of shared drawers. Here is an example of an almost empty room similar in layout to the one we were working with. My first tip is to read a few blogs (hi!) that share what worked well for them. 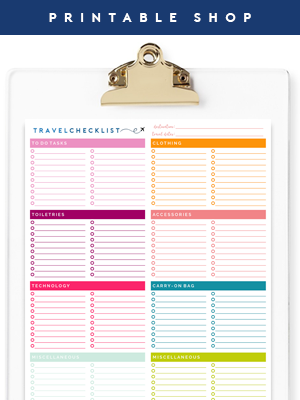 Start creating a packing list as least a month in advance based on suggestions from the blogs, friends and family. This task was in my pal's hands and she did a great job! After we unpacked majority of the room we only had to pick up a couple extra essentials... and we weren't the only ones! I don't think I have ever seen a Target so busy and picked over in all of my Target shopping experiences; it was like being on a crazy super-sized episode of Supermarket Sweep. I am sure 99% of colleges would discourage me from saying this, but I recommend bringing a few extra bins, baskets and jars. We had a plan for most things going in, but when we got to the room and began unpacking, a few things shifted and changed. And with only a quick couple of hours to set up the entire room, we were grateful we had arrived overly prepared in the storage department. During our trip to Target, the busiest aisles were storage (first) and back-to-school (second). Many students and parents began unpacking and quickly realized they needed extra bins, cubbies, shelves, baskets, etc... yet it didn't take long for the stores to become short on college supplies as well. Although we didn't utilize every last basket, bin and organizer in our heaping pile, whatever we didn't use was easy enough to bring right back home. 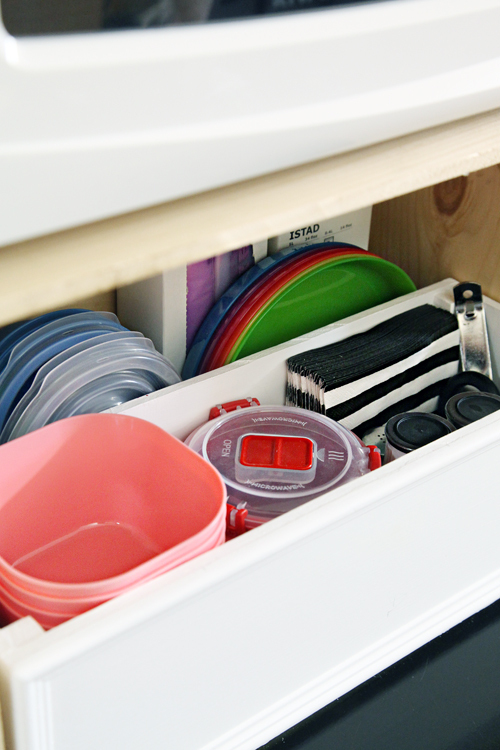 I recommend selecting storage baskets that can serve multiple purposes and are fairly general in size, as well as lidded canisters and jars for those smaller items that require wrangling. Of course this one is an oldie and always an obvious solution, but in a small room it is important to make the most of that vertical space whenever possible. We were able to place the bed on risers to offer storage for taller bins below. We also added a hutch to each surface (both the desk and set of drawers) to add shelving. The walls held pin boards and organizers and the top of each cabinet was utilized to hold baskets and even a TV. Although it may be tempting to glam up a dreary room with a decorative lamp, task lighting is where it is at. Being that the room is split and shared, task lighting allows each roommate to direct light in a very discreet and specific direction without bothering the other. 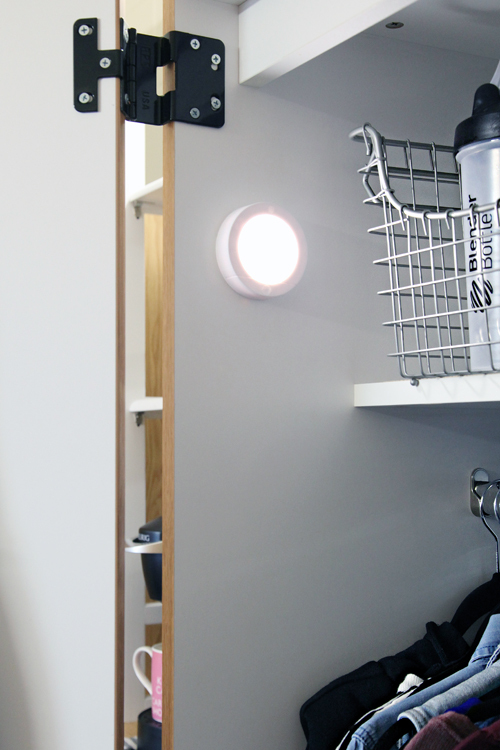 Another lighting tip is to install puck lights throughout the space to provide a small amount of light during sleeping hours. Puck lights also work wonders inside of dark closets and armoires. 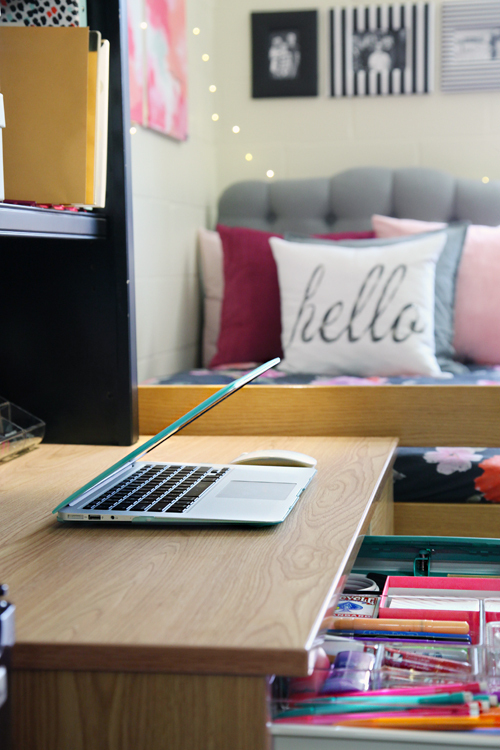 Some dorms offer the ability and space to add a futon or sofa into the mix. That wasn't the case here, so we added a soft, tufted headboard instead. This will allow the student to sit back in bed and relax comfortably while reading or watching television (you can also find a plethora of inexpensive DIY headboards on Pinterest, some even made from cardboard) . We also added an abundance of pillows and even a long body pillow to allow the bed to transform into a daybed on demand. Just as much as it is important to take advantage of vertical space, the space under the bed is also prime real estate. 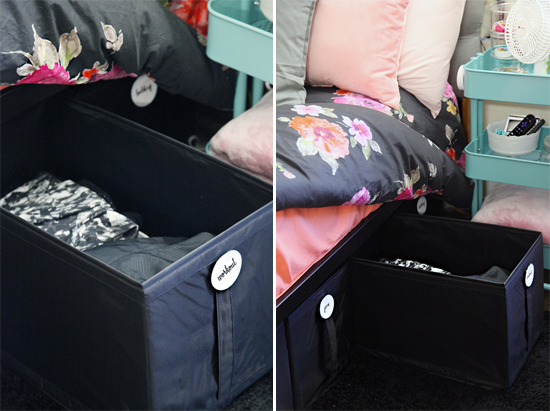 We were able to line up a whopping six, 13" tall x 22" deep bins under the bed. The bins are soft sided and light weight, so they pull out easily with the attached handle. They are generously sized and left our girl with loads of storage to spare. What we loved most is that they disappeared under the bed/duvet to blend in nice and seamlessly with her decor. We used the bins to store travel pieces/luggage, spare bedding/linens, workout items, shoes, and bulkier clothing such as outerwear and sweatshirts. We found the oh-so-charming IKEA rolling cart to be the ideal height to act as a tall bedside table. 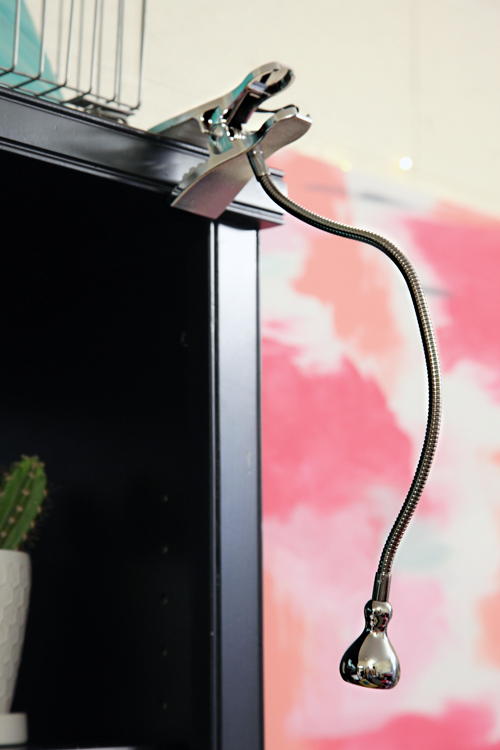 With three tiers, it also provides storage for a spare blanket, remotes, jewelry, instagram photos, a plant, cosmetics, a fan and a task lamp. I suggest purchasing stock in the Command Strip brand. 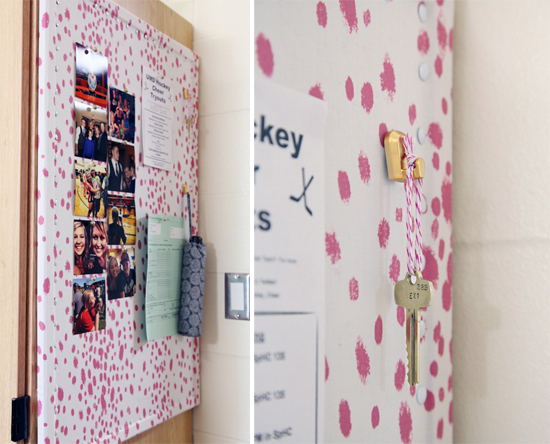 These are crucial for personalizing a dorm and we used an abundance of them around the space. We utilized them to hang frames above the bed, canvases on the wall, a hook on the hutch for headphones, inside of the armoire for a robe, a pin board on the side of the armoire, a memo board on the outside of the door and wall pockets for dishes. They were our "go to" item all day long and really allowed us to make the space feel like home. Whenever possible, try to create small zones around the space that function by category. We set up a coffee station on the top of the dresser, and the drawers below were roomy enough to hold dry foods and snacks. The Keurig can use reusable coffee pods to brew up something yummy each morning, yet is also functional for making oatmeal and soup. The armoire holds clothing, laundry, a shower caddy and a cleaning basket. The desk provides double duty as an office and vanity. So although she only has a half of a room, the small "zones" allow it to function much bigger. 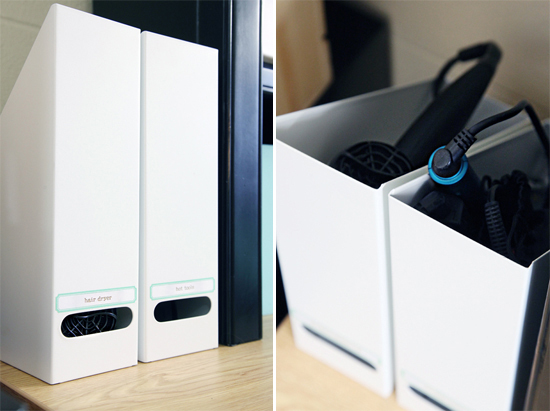 Because the desk also doubles as a vanity, it only seemed fitting for magazine files to double as hair tool storage. The steel containers are perfect for holding a hair dryer, curling rod and hair straightener. Just be sure to select a finish that won't be impacted by the heat of the tools. After our gal loaded up her clothes into the hanging organizer, we all quickly realized that it wasn't as good as it could be. The clothes looked sloppy and loose in the open slots, and it wasn't easy to grab a single item without impacting all of the pieces in the pile. After taking some measurements, we determined that these bins from Target were the perfect size and match for the hanging organizer (from IKEA). 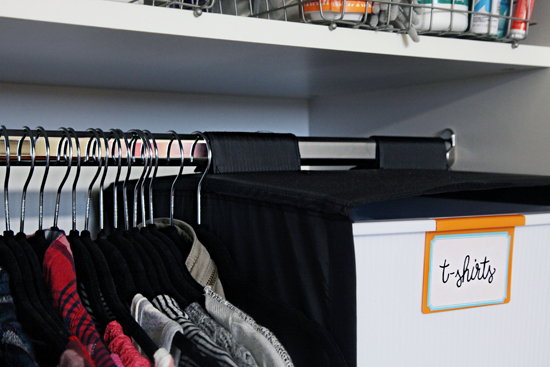 By utilizing the bins, the organizer became more sturdy (it was sagging/drooping before we used the bins), and suddenly we had full-sized drawers to work with. Now she can pull out the bin, either file her clothing (similar to my drawers here) or just toss her items inside and not think twice about them. Totally her call, but whatever she decides, she now has double the fun storage. We also used skinny, space saving felt hangers for any of the tops she wanted to hang. As I mentioned, we loaded up on extra bins and baskets and they saved us in this space in more ways than one. 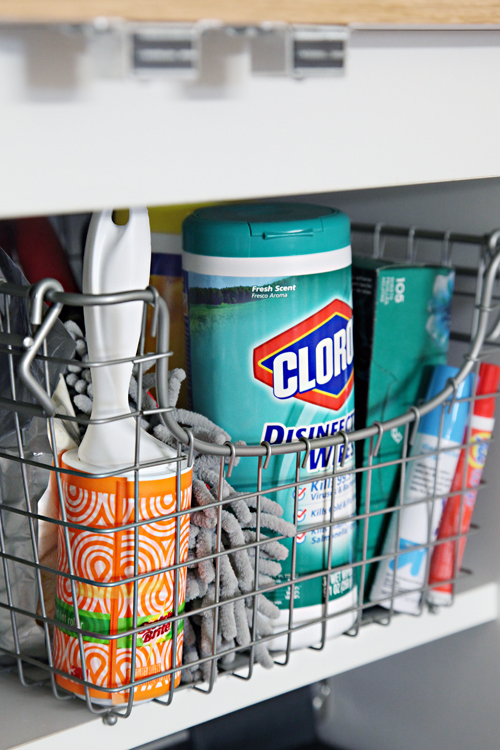 We especially loved these wire and stacking baskets, which are super versatile for everything from towels to cleaning supplies to extra binders and books. I heart caddies to the moon and back, and they also work in dorm rooms for a variety of tasks. 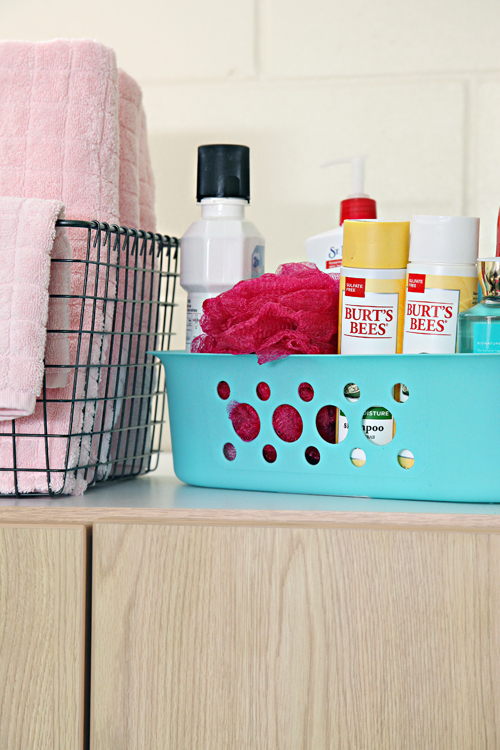 When it comes to a proper shower caddy, select something that is lightweight and water friendly yet large enough to hold full-size toiletry bottles (college students don't want to be replenishing their caddies too frequently). I used the same cork board, fabric and push pin method that worked so well for my jewelry, here in this dorm room as well. We placed it near the door and it is now in a central location to pin up important reminders and memos (students stopped by multiple times just in the first day to drop off flyers). When you utilize push-pin hooks, you also can hang keys, an umbrella and work name badge right near the door as well. Rounding out the tour was a little happy accident that I was super excited about. We had used a few empty crates to transport some of the items to the dorm from home, and they were sitting empty on the floor. I spotted them as I was trying to come up with a solution for the fridge/microwave area. By the magic of awesomeness, the hair tool holder that I built for them earlier this year, fit flawlessly inside of the crate (we brought it for the hair tools but then it worked too perfectly here and the magazine files then worked too perfectly for the tools)! I know that this was just the best accident ever, but here is the tutorial for building the small white bin. By layering the narrower bin inside of the crate, we were able to create a mini-cabinet for their dishes, napkins, food storage, can opener and salt and pepper shakers. Above the microwave, we added a few Urbio pockets (again with Command Strips), to hold additional dinnerware items. Whew! You still with me? How about a few more quick little glimpses of the work space since that is where most of the magic will happen? An old kitchen cabinet organizer received a few coats of spray paint to become a file and binder holder. 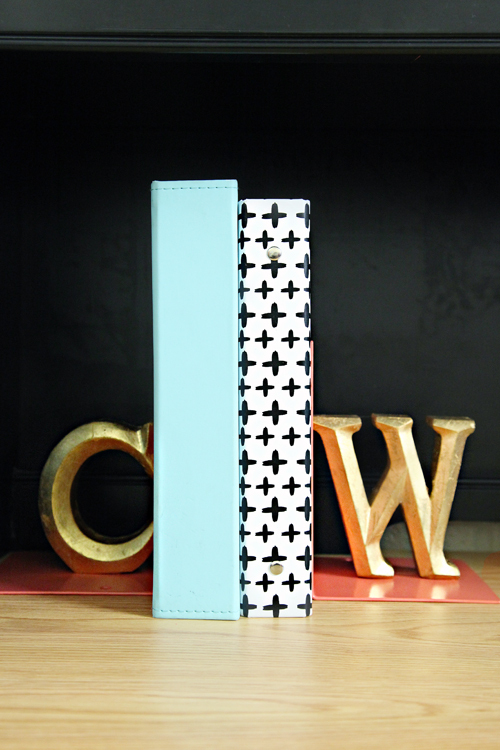 Some basic bookends were also given a little dash of color with spray paint. Then, we paired them with small gold letters to give her new textbooks the sweetest personalized place to land at the end of each day. You know me well enough to know that I wouldn't leave without giving her desk drawer a little Jen treatment. 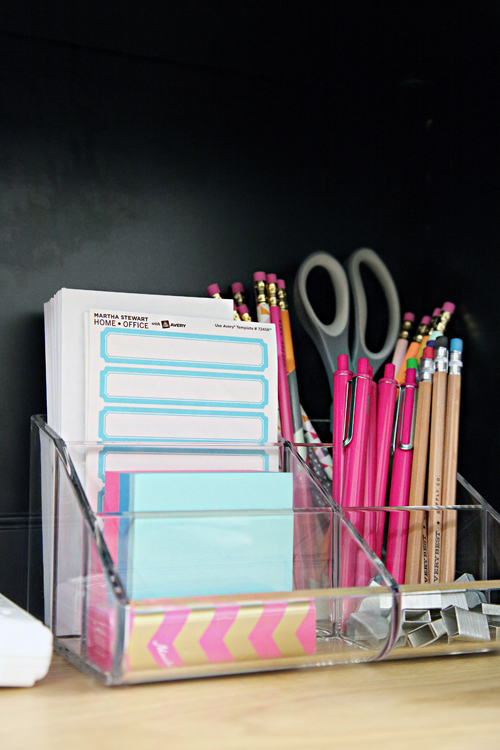 Scrapbook paper temporarily lines the drawer and peeks through the clear organizers. 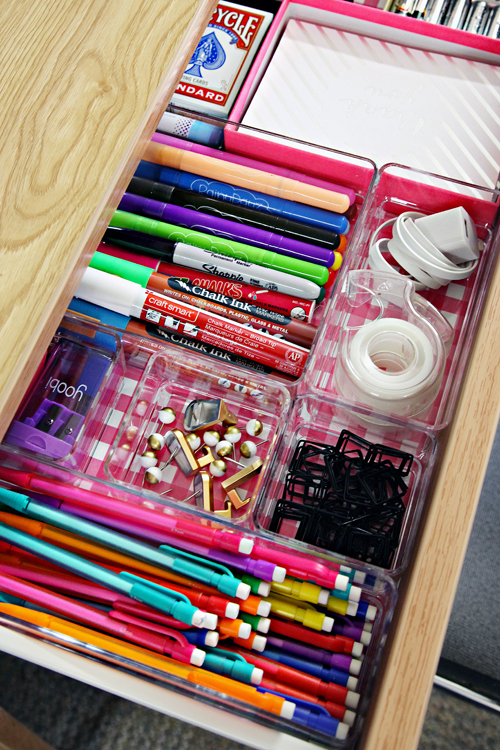 Her drawer is filled with extra pencils, chalk markers (for her door memo board), paper-clips, push pins/hooks, tape, markers, her charger, glue, a deck of cards, stationery, batteries, a laptop lock and a three hole paper punch. And a desk organizer holds a portable cell phone charger brick, memo pads, pens, scissors, more pencils, labels and envelopes. We also ran a power strip up to the top of the desk so she can easily charge her laptop and phone while studying. Move-in day was a whirlwind of amazing commotion, but we felt so great leaving our special girl with a space that feels comfortable and warm for her. We sprinkled in art, her photos and personal items to reduce any anxiety she may have been feeling about her first experience away from home. 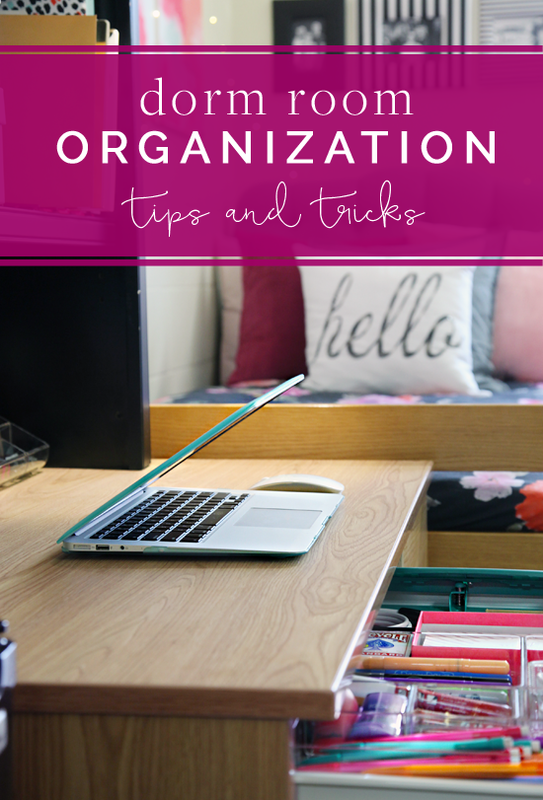 And she has already checked in and reported that this is the most organized she has ever been, and so far she has easily been able to keep everything in place. You know my heart grew about three times bigger when I heard those sweet words. Working with others to create personal and organized spaces brings me so much happiness, I can't wait to find another victim in the near future. #wink #whoisreadyforme? 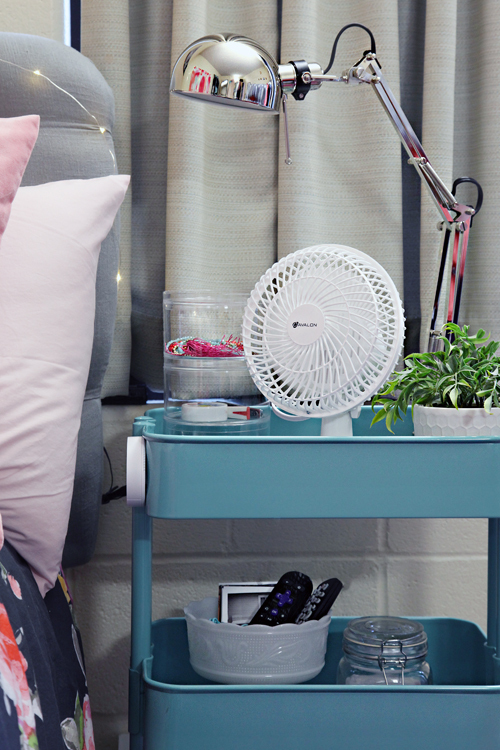 Now that you have seen how we were able to take a small and lack-luster space and give it a little love and a lot of storage, what other organization tips do you have for first time dorm dwellers? What items could you (or your son/daughter) just not live without during the good ol' college days? Update: A reader brought up a great question about the roommate. Both girls had been in touch via text message prior to moving in, which allowed them to discuss who would be supplying larger items (such as the TV, coffee maker and the microwave). This also prevented any duplication of larger items filling the space and allowed them to determine what things were OK to share (both in terms of items and space planning). Having them chatting through things ahead of time really helped the entire process go as smooth as possible. WOW, this is the best dorm room I have ever seen. The idea to add a headboard is genius! Really, fabulously done. Oh wow! I think everyone needs you to come and do their room! I remember mine having the same brick wall. I would have loved that transformation! Holy Wowzers! Her dorm looks awesome! So out of curiosity, while you and your friend were sprinkling the room with awesomeness, was her roommate there as well? Did you help make her side of the room look as nice? I'm assuming that she would be okay with the coffee bar (so loved that) on top of their shared space. Is it wrong to make your child live in a dorm just so you can decorate their space? My son has years to go before I get to that point but you've inspired me so much...LOL! I was wondering about this too! I kept thinking about how amazing the room looked, but was so scared that the roommate, and maybe even both girls, had been "taken over" and lost their chance to set up their own room. My roommate and I always got to do that initial bonding after our parents left and we decorated and organized and personalized together. I'm glad they still had an active (and hopefully the primary) role in the process. The room looks great and I WISH command hooks were invented and I had known about an upholstered faux headboard for dorm beds in 1999... Amazing job! Oh yes! They took the lead and we were there to help get everything put away quickly and help troubleshoot storage needs. The gals each took ownership of their spaces and decor and spent majority of the day together. :) xo! 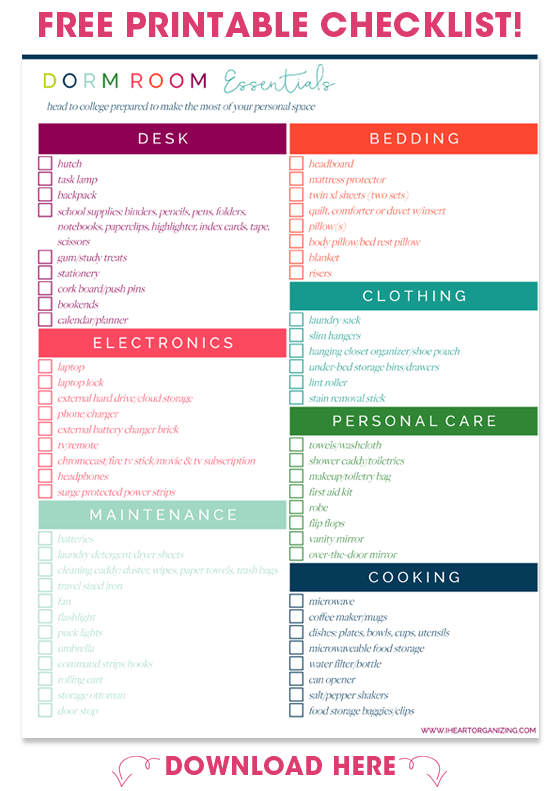 I wish I had this list when I went off to live in a dorm room! I definitely agree that command strips are the best investment. I used them on my door to hold coats or towels, and keys...whatever I needed! Although my room was the size of a glorified shoe box, when you personalize it, you never want to leave it! I'm a professional organizer. We just took our daughter to college in Dijon, France (SciencesPo), and did the same thing - 3 large suitcases on the plane, then bags and bags from IKEA and Carrefour. No way to be super OCD and over-decorate! Plus, she wouldn't let me (it is HER room, not mine, after all!). The best things we bought were a tower of plastic drawers from Carrefour at 10 euros for her dining and cooking utensils (she has to cook her own food, no cafeteria), makeup and toiletries; and this great under-sink unit from IKEA for about 20 euros (http://www.ikea.com/us/en/catalog/products/90093759/). Instead of under bed bins, we put 2 of the largest suitcases under there. One holds all her shoes/purses and the other holds all her winter clothes, etc. She'll need those to come home in December and at the end of the year! Where did you get the puck lights? 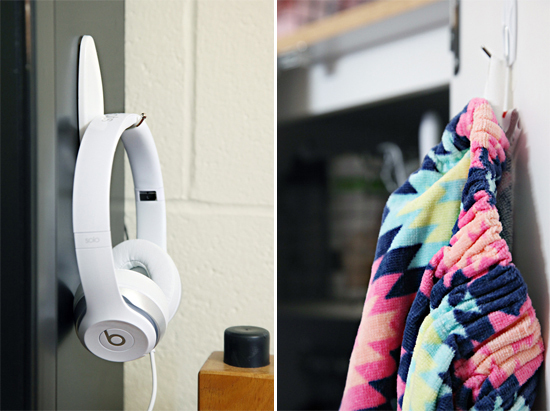 Her dorm room is AMAZING! Man, I would've killed to have a dorm room that looked this pretty and was so organized! SERIOUSLY saving this for next year. As SAD as I will be to sending off my ONLY child next year, one of the life skills I am hoping to learns is organization. I'll set her up but it will be her job to maintain. THANK YOU for all the tips & ideas. EEP!!!! SQUEEE SO much love for this dorm room!! 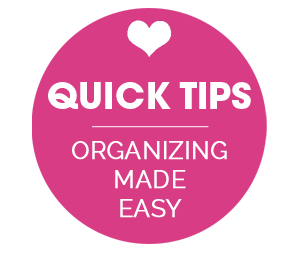 Your sweet heart has to be feeling like she can conquer the world being that organized. My dorm was never this meticulous and quite frankly...neither is my house! Come be my biffle and let's have an organizing party :P I am going to use a lot of these ideas for each of my children's rooms. We have a large house, but most of the space was used in the common areas and the bedrooms/bathrooms are a titch on the small side. I would love to see the finished product (Whole-room photos) if you have them!! Since we got to see the "before" photos, I'd love to see the "after" as well! It looks amazing! I lived in a dorm for two years. The first year was with a super messy roommate and that was not fun. But my second year, i roomed with my best friend and we had similar tastes with a pretty room. But this room is amazing! Can you come organize my house/life! Oh, I know right?! Although I didn't live in a dorm, the room I did have in the student house was not anything as awesome as this. :) It was fun to live vicariously through them this time around. I had a super organized dorm room my first year of university, but I could definitely have used a nice padded headboard! I was super fortunate to have a double room all to myself, but the available storage left much to be desired. I made it work wonderfully, though! Now I'm feeling majorly nostalgic for my first year of university! You are SO good, Jen! I wish your skills would rub off on me! This is such a perfectly decorated and well executed organized space! Kudos on another homerun, so to speak! Jen, this is one of my favorite posts of yours! Ha! I never had a dorm room (went to a community college), I've never even been in a dorm room and my oldest child is in fifth grade but I'm so giddy about this room! You totally worked your magic in this space and I can only hope to be this organized when I (hopefully!!) send one of my kids off to college. Totally love this! Wow! I wish my room at uni looked as good as this. It's definitely given me some ideas though. This makes me want to go back to college! Love your ideas! So wish my dorm room would have looked like this! 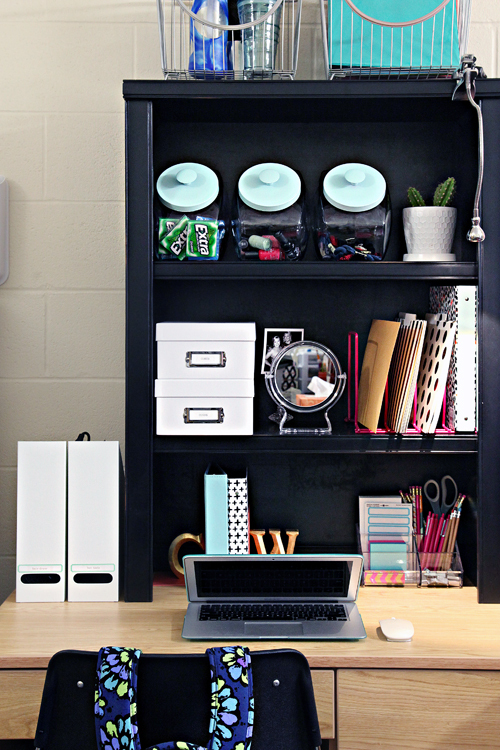 My daughter is no where near heading to college but I still see a lot of solutions for her bedroom. Love this! great tips!!! we just moved my son in - i love those skubb boxes! i wish i had known about them! we used laundry baskets because they were 1. cheap, and 2. they nested int he car and took up NO ROOM! i definitely share your take on #2 - overpack on storage! i knew that we could always bring it home. but actually, we ended up passing on the few bins i had left because they were old anyway, and it was a good way to make a new friend :) we were pleased that everything went into the room the way we had thought it out - but i did a lot of research on the shapes of the room and the furniture - i was stalking the college's facebook page & website continually! I will see if I can find the exact source for you, but I believe that if you were to search "LED Fairy Lights" you may find a few options. :) xo! Urban Outfitters has them. I purchased them for my daughters room. Ikea had an excellent string when I went last. ..not sure if this year they are still there. Wow, this looks AMAZING. That is one lucky girl! Wow - this is great, Jen! A lot of good forethought from you, your friend, and the new roommates... Makes me "kind of" wish I were in school again and had you and your wizardry to make a dorm room so organized and fun! 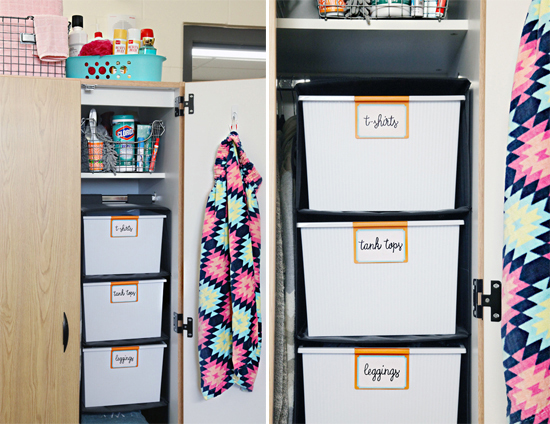 What an amazing resource for setting up a dorm room! I've still got a few years until my kids go to University, but I am pinning this and tucking it away for the future :) In the meantime, this inspires me to do some things in my kids' bedrooms here at home to make them more "their space". 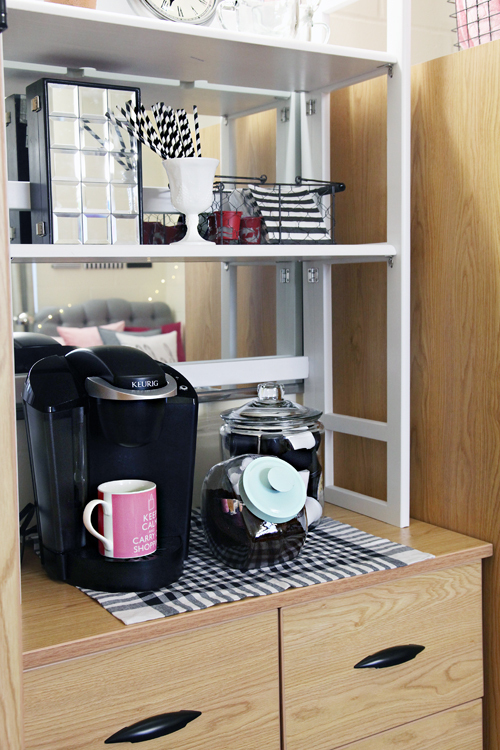 Such a cute and functional dorm room! Love it. How was the headboard attached to the existing bed? Did you just wedge the headboard between the existing headboard and mattress? The headboard had grooves in the back to offer the ability to add legs to it, but those grooved areas ended up fitting with the posts of her bed so we didn't need to do much (it kind of just stuck/wedged in). However, the headboard could have been placed on legs or secured with heavy duty Velcro and command hooks. What a pretty dorm room! I love the work space. I bet my niece would be delighted to see this. There's a lot of great ideas here for her dorm room. I would LOVE to see a wide angle shot of this room after all the great organization from the same perspective as the before shots. The close-ups are wonderful! You're amazing Jen! I am seriously in awe of your gift to transform a space!! Looks great!!!!!!! Looks fabulous. 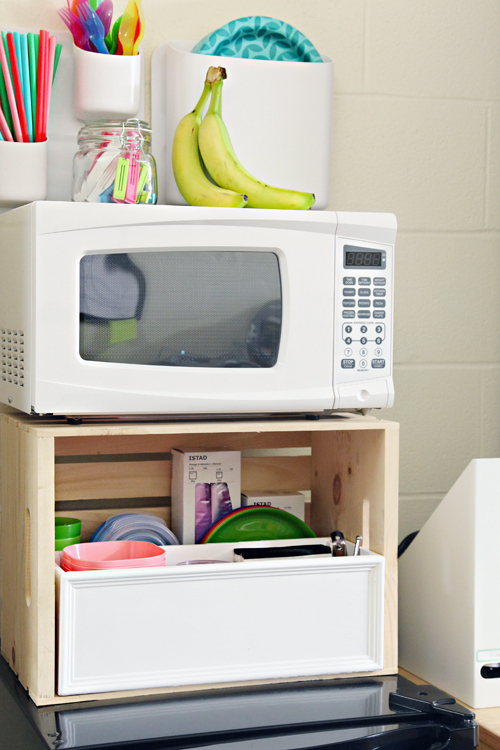 I shared a list of dorm room essentials on my blog as well a few weeks ago. Always great to know what worked for those who have already been there. The black hutch was re-purposed from a piece of furniture the family already owned, while the smaller white one was found at the Container Store (linked in my sources above). I see them quite frequently on Craigslist, and higher end retailers such as Pottery Barn and Land of Nod as well. Wow, awesome space. I'm sure this lucky girl is the envy of her dorm! I've got some ideas now for when my son goes off to college next year and just wishing I had all these ideas when my daughter was in college several years ago! Thanks as always for inspiring my organization! My girlfriend had majority of the items for the space already at home (jars from her kitchen, headboard, rolling cart, black hutch, etc...) and managed her own budget for the additional purchases that came up. I believe that she set aside X amount of funds for the process a few months ago and managed to that. Although I don't know what her exact budget was for the project, I was there to offer ideas and suggestions that fit her needs and budget along the way. So pretty! And functional. A great way to start her college years. How did you all make and attach this headboard so that it does not move around? And what type of risers did you use underneath the bed that allow it to be stable? This post simply was perfect, it inspired me, the pictures are beautiful! But.. will she really need that much pencils aha ? Wow! I had a fairly large dorm room (triple occupancy) my freshman year in college but a much smaller one my sophomore year. I wish I had these tips back then! That dorm room is HUGE compared to the ones i've seen. HUGE, with lots of storage built in. We learned to pack lean and live spartan. I packed up two boys for college, everything (and everyone) in a Honda CRV, with a roof rack. Bulky bedding goes into vacuum storage bags and into the roof rack. They each got one large suitcase for clothes... that's why there are washing machines at school. School supplies are minimal because most work is done on a laptop and submitted digitally. I do recommend bringing power strips. Never enough outlets. Also, very long ethernet cord because, again, connections aren't always where you want them. Command adhesive strips/hooks are the BEST. They need a lot less stuff than they think they do. I have a junior and a senior in college. Each year, they take less stuff because they learn that it is just a hassle to pack & move. Adorable!! Great work I'm sharing with my niece! Jen!! This is amazing! You continually surprise me with inspiration and joy every time I read a post of yours. This one falls nothing short is spectacular! My favorite part by far is the headboard. Excellent additions to the room. And I love that some projects aren't small on budget, but a little more expensive. Like this one, I love seeing the PB Teen comforter. A little pricier bit definitely packs the punch in classy and adorable. Thank you again for wow-ing us with your talent! This is the best - I love small space organising! She's going to have such a great time here - well done! this is so organize !!!! Being a PO myself, I had a lot of fun with moving my youngest girl into college. We got the same IKEA rolling shelf, which is so vintage and wonderful. I also brought a lot of storage containers, drawer dividers, etc. We didn't use it all, but we were ready for whatever we found. We also had the hanging storage for her shoes, and collapsible/fabric covered boxes in various sizes. She had coordinated on colors with her roommate and the room ended up looking great. Very impressive! 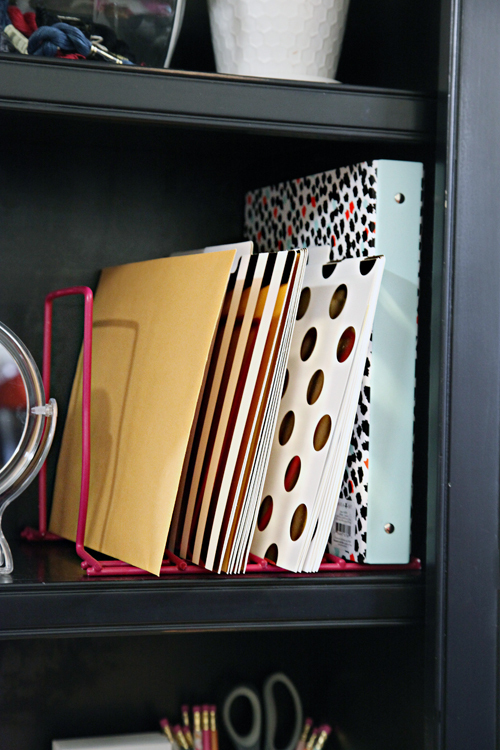 I've followed your blog for awhile now, and love your space saving, and cute organization ideas! 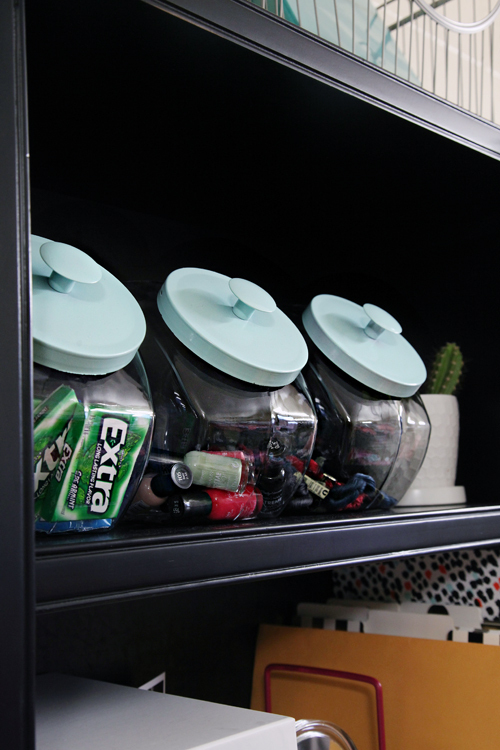 I was wondering if you'd ever though of how you'd organize a cubical - I think the hutch idea might be a great thing for us cubical dwellers to try! Only having one, two-deep drawer-ed filing cabinet it tough! Thanks for the inspiration! Wow!! It looks amazing! I think I'd better get saving for my daughter's college room in 6 years now!! She would LOVE this! Wow!! That is probably the fanciest real (not in an ad or on tv) dorm room I've ever seen! My organizing wasn't nearly so pretty when I went to college! This makes me miss that time, just a little bit. Awesome job! And LOVE the headboard. That really makes it cozy! Looking at the decorations from the before picks I'm thinking we moved our daughter onto the same campus. She has a triple occupancy room, but one of the roommates dropped. I'd love to have a room this organized, but my daughter is more of the "Just the basics, mom." kind of girl. Looks great though, will have to keep these ideas in mind when the younger daughter goes to college. Love the look. A few questions...what color is the duvet? In some lighting it looks dark grey in others black? I'm looking to use it in a room myself and can't tell what would coordinate with it. Also, do you know where the hello pillow came from. Thanks and great job! Looks great. Very different experience I think to going to university in the UK. Here students generally have single rooms I think and you would do all of this yourself with little parental involvement. Also wondered where the books are? Fantastic ideas here! But mama, I hate to tell you, even if you want all of the magic to happen at the work space, I doubt that is where "all" the magic is gonna happen, LOL I just had to chuckle when I read that part, because I have a daughter in college as well! You are a genius, omg your work is so amazing. I have to say I wasn't very excited about your big project aka the kitchen etc but only because I'm not concerned for the moment, not because it's not interesting or nice. It's always the "little" things that are magical to me. The headstand is so cosy, it changes the mood of the room. You have to dare to make the difference ! I want to make some changes in my son's room (big boy turns 12 !) and the ikea rolling cart would be perfect for his room. I should think "outside the box" a littlte bit more ! I'm french and I'm not fluent in english, so I'm little frustrated because I follow you for a long time & I can't really tell how much I love your posts ! This is an amazing post, Jen -- thank you! My daughter starts college next fall and this is definitely going on my Dorm Pinterest board. Would you mind telling me where you found the push-pin hooks? I have always admired your talent in turning something so ordinary into something unique and useful, this post surely gave many ideas for my little girl first ever desk :) thank you! What GREAT solutions and wow would I ever want to go back to university/college to have a room like that! Such great solutions and it's so great that the roommate was on board with everything :) Love it!! Hi, amazingly cute room, but where is that hutch from? so beautiful! so inspiring! you are so talented. 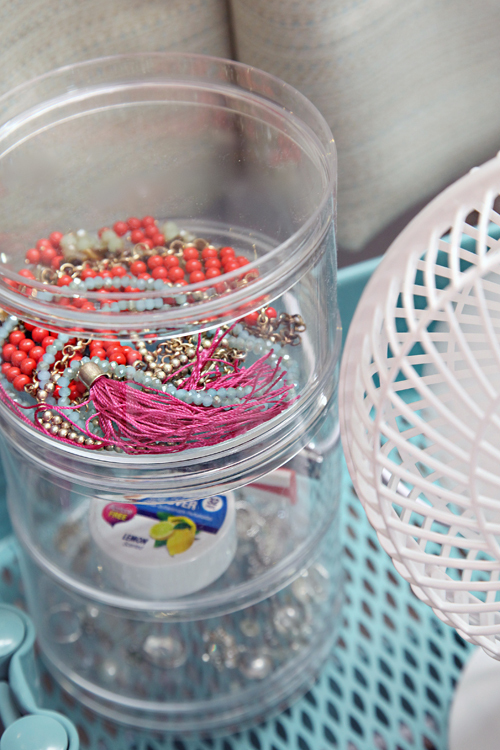 where did you get the acrylic desk organizer (not the one inside the drawer, the one on the desk with the scissors)? Where did you get that shelf that went atop the desk? I've been looking for something like that everywhere! Hi! I love how you stacked the fridge and the microwave with the crate. I saw this post a few weeks ago and have been looking for a crate big enough to hold my microwave ever since then. I am moving back into my dorm in a few weeksand was just wondering where did you get the crate? Also, do you know the dimensions of it? I don't recall the specific dimensions, however, I have seen similar crates at Home Depot, JoAnn and Michaels. I also think the microwave was a pretty small model. Best of luck and I wish you a great school year! We are getting ready to send our THIRD child (and only son) to college. 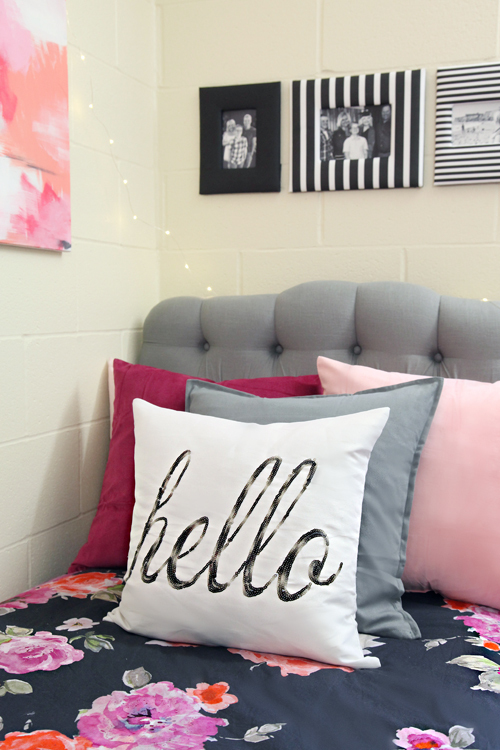 I have read many dorm room blogs and yours is my favorite! 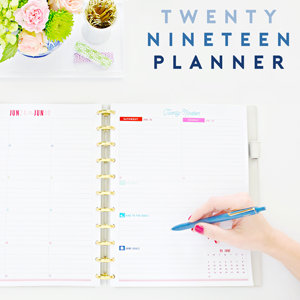 You have fantastic advice,coupled with great photos and links for the items. You are so upbeat and your writing makes it fun and exciting! 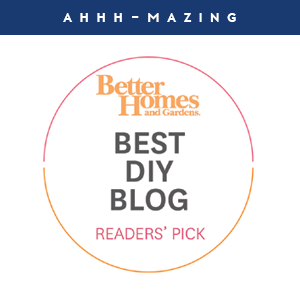 Thanks for a wonderful blog! My daughter will move into her first dorm in a few weeks. Your info in this blog is the most helpful. We want to use a bookcase on her desk and have looked everywhere for a bookcase similar to the black on shown here and have not found anything close. Where did you find this one. Please help. Thank you. Unfortunately the black one was an old family/thrifted piece, so I don't have an exact source. I found this one at Walmart which looks similar: http://rstyle.me/cz-n/cp8vnbb5y77. 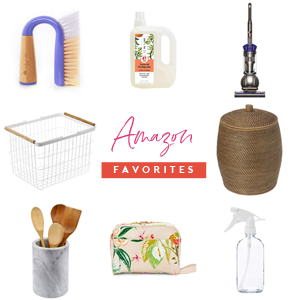 You may also be able to find something on Amazon: http://amzn.to/2sLDVbE. I would also recommend searching some hutch keywords on your local Craigslist website. :) Best of luck moving your daughter!! Where did you get the hutch for the desk? This is from UMD! I'm heading there this fall. Would you mind disclosing what building this was in? I love all of these ideas!